Sitter: Major Reginald Wynn-Wynne (1857-1913). Biog: Entered Pembroke Yeomanry; Recruiting Officer to the Imperial Yeomanry; Raised Westminster Dragoons; Assistant Transport-Officer to Generals Sir I. Hamilton and Sir J.D. French during Boer War. 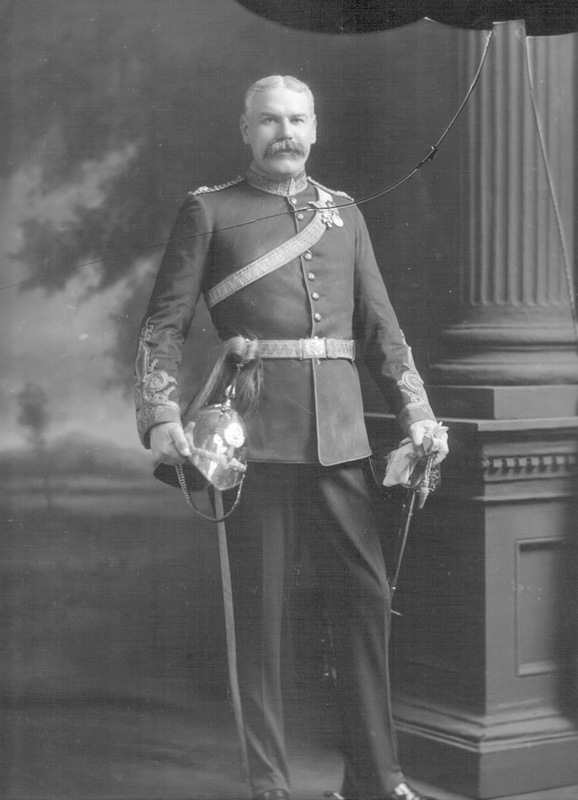 Costume: Full Dress uniform, Major, Westminster Dragoons (Imperial Yeomanry). Orders, Decorations & Medals: The Distinguished Service Order [London Gazette, 27 September, 1901]; Queen's South Africa medal 1899-1902, with three bars. Biog: Who's Who; Army Lists; The Times, 25 September, 1913, p 9d. Orders, Decorations & Medals: (D.S.O) Sir O'Moore Creagh, and E.M. Humphris, The Distinguished Service Order 1886-1923, (facsimile edition), London, 1978; (Queen's South Africa medal) E.C. Joslin, A.R. Litherland & B.T. Simpkin, British Battles & Medals, London, 1988.